Explanation: A remarkably intense auroral band flooded the northern night with shimmering colours on December 7. The stunning sequence captured here was made with a camera fixed to a tripod under cold, clear skies near Ester, just outside of Fairbanks, Alaska. 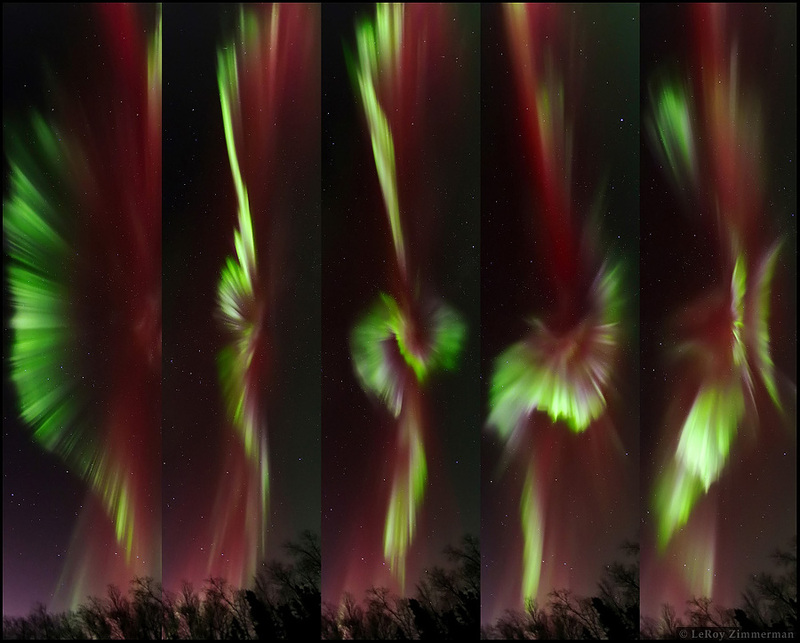 Left to right, spanning a period of about 30 minutes, the panels follow changes in the dancing curtains of northern lights extending to altitudes of over 100 kilometres in a band arcing directly overhead. The panels span 150 degrees vertically, covering about 500 kilometres of aurora laying across the sky from edge to edge. The auroral activity was triggered by a moderate level geomagnetic storm, as a high speed solar wind stream buffeted planet Earth's magnetosphere.